Back to School Style...on a budget! Home » Smart Life » Baby / Children » Back to School Style…on a budget! Back to School Style…on a budget! Ahhh, back to school. Some kids love it, others hate it. But either way you should make sure your kids are going back feeling confident and stylish for the new year. Young girls, in particular, can be under a lot of pressure to wear the right clothes and look a certain way. Luckily, big-box stores like Target, WalMart, and KMart have come a long way in the cute clothes department since you and I were in school. The celebrity-inspired looks below can easily be replicated on a budget. Each outfit can be altered to make it look younger or older, depending on the age of your daughter. Taylor Swift is a great role model for young girls. She always carries herself with grace and dresses with modesty — which is so refreshing when considering her contemporaries! Nautical pieces always seem to be trending, and this fall won’t be an exception. 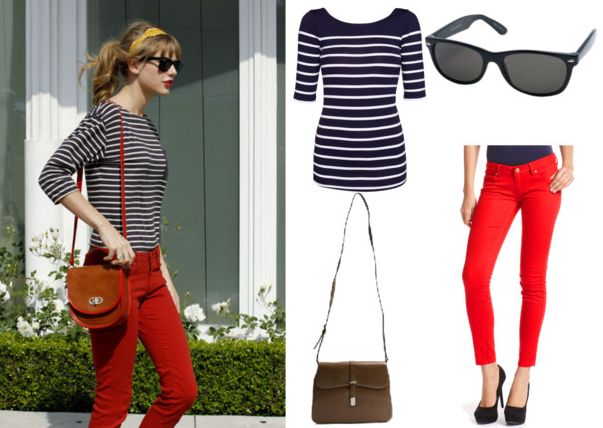 For a nautical look, think stripes and colors like navy blue, red, and white. Colorful jeans are big, so consider a pair or two in your daughter’s favorite colors. This look from Big Time Rush‘s Ciara Bravo is a little bit country, a little bit bohemian. All-out denim is trending, and there are cute jean dresses available for every age. If your daughter’s shoulders must be covered, a versatile denim jacket will do the trick and can be worn with a variety of looks. A pair of simple tan or brown oxford shoes can be dressed up or down very easily. If your daughter has a more sporty or relaxed style, then consider this look inspired by Selena Gomez. Simple denim shorts or blue jeans paired with a basic knit top is cute, comfortable, and easily accessible for any budget. A pair of colorful Converse All-Star shoes are a practical choice, as they can be worn with a number of different outfits. Also don’t forget the accessories! Costume jewelry from stores like Claire’s is an inexpensive and cute way to help your daughter feel stylish. Are you sending your daughter back to school? What trends is she wanting to wear this fall? Author bio: Sarah Heckle is a writer, editor, and blogger from Indianapolis. Get Organized This School Year!